We arrived Bhadravathi after travelling the in 250 km (155 miles) north-west from Bangalore by train. 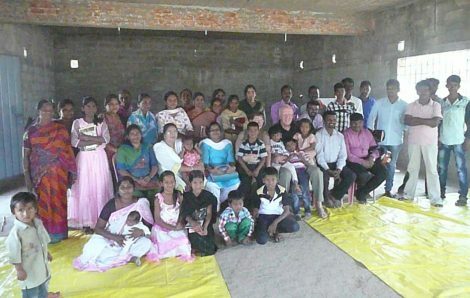 Bhadravathi is a small town by Indian standards and the ecclesial family here consists of about 30 adults and 15 children. We are always met by the entire Johnson family when we arrive and this time was no exception. Brother Guna arrived early Saturday morning, riding in ‘general class’ all night. On Saturday, Brother Bruce Parker gave two classes on a few of the psalms. It took a while for the audience to participate when he asked for their thoughts, but Sister Anita led the way and soon others had ideas to share too. Later, on Saturday evening, we were invited to the home of a pastor who had attended the sessions earlier in the day. Another couple of pastors were there as well, plus the extended family of the host – about 25 people in total. Brother Johnson had organised the sessions and Brother Bruce gave a good summary of the Abrahamic promises, Resurrection, the kingdom on earth and the need to study the Old Testament as well as the New. Brother Johnson received a call from one of the pastors later that evening, saying that he had appreciated the in-depth study and that it had been new learning for him. After the study, the family served us a meal that was so spicy that even the Johnson family and Guna commented. Bruce and I shared a plate and bravely swallowed the repast. The Sunday service was more traditional than we’ve noticed in the past. Bruce spoke on Psalm 40, again seeking thoughts from the audience. The Breaking of Bread, with people seated and singing softly, felt appropriately worshipful. They sing from a list of songs which Brother Tim Galbraith evidently provided at some point, and which most have them memorised. After the service, many stayed around and tea was served. The stragglers were still there at least an hour after the meeting had finished and the building was being closed up. Two of the last couples and their children to leave are what Anita calls ‘the pillars’ – they’ve been with the Johnson family since the beginning of the meeting in this area. Both brothers participate by leading hymns and prayers. The building in which the meeting is held is still a work in progress – with considerable progress still needed. The first floor is enclosed, but the concrete is not smoothed or painted on the inside. For seating there are about 20 plastic chairs and large plastic tarpaulins on the dirt floor. A bathroom is just being finished, thanks to the generosity of one of the new attendees. Sister Anita wishes for a Sunday School room and she is hoping a small room at the rear may be fixed up for that purpose. Of greater concern is that there are attendees who are clearly malnourished. Sister Anita would like help in nutritional supplementation – not just for them, but for the children in the ever-growing slum just behind the hall. We finished our visit with just enough time to treat Johnson and family (and our auto driver) to lunch. During the meal, Anita shared that Johnson is not well, possibly on the tail end of a bout of malaria. This weekend was the first time he had not had a fever for a while. We felt so humbled that he had soldiered through the weekend with warmth and smiles while feeling drained. This is yet another area of the vineyard in which there is much work to be done and which would welcome more field worker visits. We are thankful to our Heavenly Father who blessed us with the time to share the faith with our brothers and sisters, with those just learning the truth and with those interested in what the Bible really has to say.